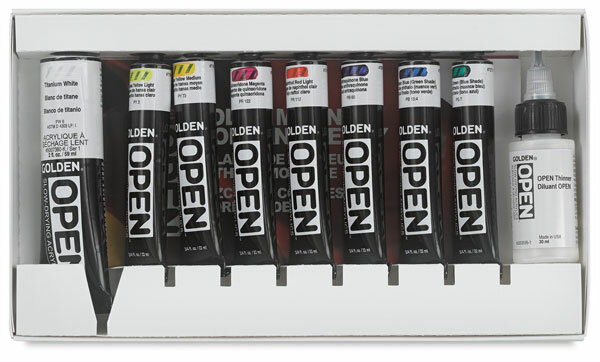 Get outside into the open air with Golden Open Acrylics Sets. This line of professional acrylic colors is formulated with a unique, relaxed set of working properties. They stay wet longer, even in outdoor conditions. Because Open Acrylics remain wet on the palette for extended periods of time, your color mixes are usable longer — and that results in less wasted paint. Explore a wide range of techniques with these versatile paints, including plein air painting, portraiture, monoprinting, and screen printing. These sets are perfect for experimenting with this exciting line of acrylics colors. Color Mixing Modern Theory Set — Assembled to provide a broad-ranging palette for contemporary artists, this set contains 0.75 oz (22 ml) tubes of Anthraquinone Blue, Benzimidazolone Yellow Light, Benzimidazolone Yellow Medium, Naphthol Red Light, Phthalo Blue (Green Shade), Phthalo Green (Blue Shade), and Quinacridone Magenta, plus a 2 oz (59 ml) tube of Titanium White, a 1 oz bottle of thinner, and a color mixing guide. Introductory Set of 6, Traditional Colors — This set contains 0.75 oz (22 ml) tubes of Alizarin Crimson Hue, Indian Yellow Hue, Sap Green Hue, Ultramarine Blue, Van Dyke Brown Hue, and Titanium White. Introductory Set of 6, Modern Colors — This set contains 0.75 oz (22 ml) tubes of Hansa Yellow Opaque, Phthalo Blue (Green Shade), Phthalo Green (Blue Shade), Pyrrole Red, Quinacridone Magenta, and Titanium White. Landscape Set — This set starts you off with an ideal outdoor painting palette. It includes 0.75 oz (22 ml) tubes of Alizarin Crimson Hue, Cadmium Red Light, Cadmium Yellow Primrose, Manganese Blue Hue, Sap Green Hue, Ultramarine Blue, and Yellow Ochre, plus a 2 oz tube of Titanium White and a 1 oz bottle of Open Thinner. What makes Golden Open Acrylics different from traditional acrylics? 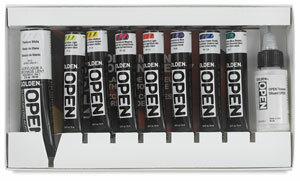 These artist quality Open paints allow for wet-on-wet techniques and a more relaxed approach to acrylic painting, similar to that of oil painting.